This is an intense chocolate dessert that utilizes the health benefits of tofu. 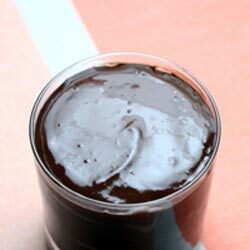 Mexican Chocolate Pudding packs protein, fiber and best of all, good taste! Puree the tofu with the coffee in a food processor or blender until very smooth, adding the coffee slowly, and scraping down the sides as needed. Add the cocoa powder and sugar, process until smooth. Add the vanilla extract and spices, pulsing to completely blend. Divide the mixture between wine glasses or dessert bowls. Nutritional analysis per serving: 120 calories, 4.5 grams protein, 21 grams carbohydrates, 3 grams fat, 6 mg. sodium, 1.5 grams fiber.